Plenum is the air return path of a central air handling system, either ductwork or open space over a suspended ceiling. Plenum Cable is approved by a recognized agency such as UL for installation in plenums without the need for conduit. 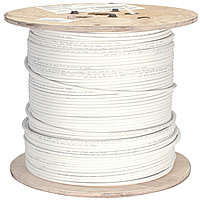 Plenum wire has a low smoke, flame retardant jacket and meets specific requirements by most state Fire Marshall Codes. This plenum coaxial wire features 18 ga. fully annealed solid bare copper center conductor with premium grade foam FEP dielectric. 100% Flexfoil® plus 61% tinned copper braid provides excellent protection from RF and EM interference. Flexguard® PVC jacket designed to meet UL 910 flame test. NEC Article 725 and 444 Compliant. 1,000 ft. reel.